The STI-3331 extends where you can hear your doorbell. 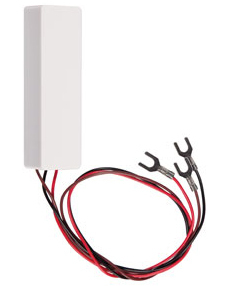 The STI-3350 wireless doorbell chime connects to your existing traditional hard wired doorbell and extends where you can hear your doorbell. Once the unit is wired into your existing system, the included receiver can be plugged into any standard electrical outlet up to 500' (line of sight) from the existing doorbell. This allows you to hear when someone is at your front door when you are in the basement, garage or other part of the house or business, where you normally can't hear your doorbell. This transmitter sends a signal when the front doorbell button is pressed causing the receiver to play "ding-dong" and "dong" for the back or secondary doorbell button.